The apartment is on the first floor in a newly built condominium. Located in Rivoltella, a few kilometers from Sirmione, where the famous thermal baths rise, and 2 steps from the center of Desenzano, reachable by foot in a few minutes along a beautiful lake promenade. The living room, bright thanks to a large window, will surprise you for the pleasant and harmonious combination between modern and ethnic. The kitchenette is equipped with an electric oven, a microwave, a toaster, a dishwasher, a kettle and all that can be used for a meal with friends. Adjacent, a spacious balcony with table and chairs. At any time of day you can choose to "dive" in the tub for a moment of extreme relaxation or if you opt for a refreshing shower. For any eventuality, you will have at your disposal a small room used as a laundry. The colorful bedrooms, both doubles, have spacious wardrobes. Upon your arrival we will be happy to welcome you in our house, explaining briefly the necessary for the management of the apartment. We will support you for any eventuality during your stay and we will be happy to give you some advice to make the most of your stay. Eine sehr gemütliche und gepflegte Wohnung in einer netten Umgebung mit top Vermieter! Wir haben unseren Aufenthalt sehr genossen und kommen jederzeit wieder! Wir waren 11 Tage in der Wohnung zu Gast. Die Wohnung ist liebevoll, gemütlich eingerichtet und beinhaltet alles, was man braucht. Ein kleines Frühstück und Wasser wurden von den Vermietern für den nächsten Morgen bereit gestellt, etwas Kaffee war vorhanden, so dass man erstmal ankommen konnte ohne gleich einkaufen gehen zu müssen. Das Auto kann in der Tiefgarage untergebracht werden, wo noch 2 Fahrräder vorhanden sind. Wie man den Bildern entnehmen kann ist eine Bahnlinie in unmittelbarer Nähe, was uns nicht gestört hat. Die Betten sind bequem und auch sonst haben wir uns sehr wohl gefühlt. Für Fragen steht der Vermieter gut zur Verfügung. Informationen über mögliche Freizeitaktivitäten gibt es auch in der Wohnung und einen kleinen Stadtplan. Wir würden wieder hier wohnen wollen. We hebben het fantastisch gehad. Een heerlijke plek bij het Gardameer. Desenzano, Sirmione, Pechiera, Lasize, Verona, Venetie, allemaal gemakkelijk van hieruit te bereiken. Het huis heel sfeervol en keuken meer dan compleet ingericht, we hadden zelfs fietsen ter beschikking. Alfredo en Eleonora zijn heel hartelijke mensen. Très bel appartement, très bon accueil. Nous recommanderons votre appartement de notre côté. Die Wohnung ist für ein kurzen Aufenthalt von ein bis zwei Wochen perfekt. Das einzigste was mich auf dauer stören würde sind die Federmatratzen aber sonst gibt es nichts auszusetzen. 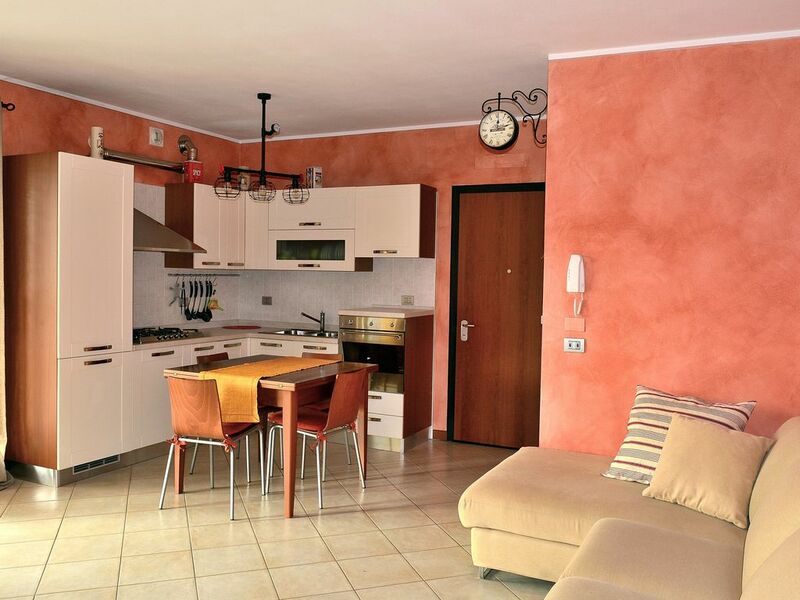 The apartment is located in a strategic area because from here it is possible to reach the most important and renowned tourist resorts of Garda. In the immediate vicinity (500m) you can find a supermarket, a tobacco shop and post office as well as city bus stops. A little further away you will find some bars and restaurants until you get to the nearest and best served beach in the area which is 1.5 km from the apartment. From this beach you have access to the beautiful lake promenade that will take you directly to Desenzano, which with the castle, the museum and the remains of a Roman villa, is only 4 km away. In the center you can relax by shopping in the many shops, stop for an aperitif and dine in the different restaurants. In the center there is also the berthing of the boats with which it is possible to reach the other lake locations. It is also possible to rent small motorboats with or without a driver. For sailing lovers there is also a sailing club, considered by the Italian Federation to be one of the most important sailing gyms in Italy, where it is possible to book courses. There are also several itineraries to be covered by bicycle. Just outside the inhabited center surrounded by greenery in the moraine hills, you can get to the Tower of San Martino monument admired for its majesty outside and for its artistic merits inside and from which, once you get to the top, you can enjoy a breathtaking view. A little further (8km from the apartment) you will arrive in Sirmione which will immediately strike you with the beauty of its Scaliger castle. Inside the walls you will lose yourself in the narrow streets full of restaurants and ice-cream bars until you reach the tip of the peninsula where you will find the Grotte di Catullo. Sirmione is also well known for its thermal baths. A little further on we will find Peschiera, a charming town on the Veronese shore of the lake, gateway to two of the most famous amusement parks in the area: Gardaland and Caneva Acquapark suitable for the whole family. In the nearby areas there are beaches where you can rent jet skis, beaches where you can have fun with towing inflatables .. For those who want to immerse themselves in the green moraine hills that surround the area and follow the many routes that can be traveled by bicycle or to be even more immersed in nature make trekking on horseback. In short, there is something for everyone. For a trip out of the city, given the proximity to the motorway and the railway station, it is possible to reach cities such as Verona, Milan and Venice.